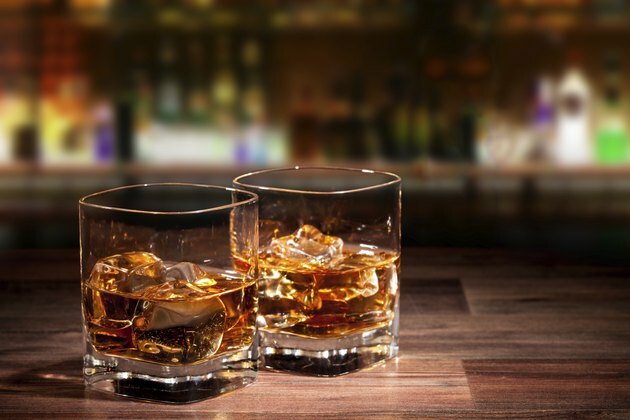 Any type of alcohol can increase your risk for weight gain, according to a study published in "Critical Reviews in Clinical and Laboratory Science" in 2005, although the size of the effect varies between individuals. Some alcoholic beverages have more calories than others, which makes them more likely to cause you to go over your daily calorie allotment and gain weight, but liquor isn't necessarily more fattening than beer. Liquor can be slightly lower in calories per serving than beer. A 12-ounce light beer has about 103 calories, a regular beer has about 153 calories and a 1.5-ounce serving of 80-proof gin, vodka, tequila, whiskey or rum has about 97 calories. Adding mixers to your liquor to create mixed drinks or cocktails can make your beverage much higher in calories, however, depending on the mixer and the size of the drink. For example, an 8-ounce margarita has 453 calories, an 8-ounce Singapore sling has 230 calories and a 6-ounce chocolate martini has 438 calories. Alcohol provides more calories per gram -- with 7.1 calories per gram -- than carbohydrates or protein, which each contain 4 calories per gram. This can make it easy to get too many calories if you drink alcohol regularly, which will lead to weight gain. A lot of variability exists between people, however, in the effects that alcohol has on weight gain, according to a study published in "Critical Reviews in Clinical and Laboratory Science" in 2005. Overweight people tend to be more affected than people of normal weight; moderate drinkers are more affected than heavy drinkers; and drinkers who eat a high-fat diet tend to gain more weight than drinkers who follow a healthier diet. Drinking more than an ounce of alcohol per day can lead to weight gain, according to a study published in "The American Journal of Clinical Nutrition" in May 2003. The type of alcohol doesn't make a difference, just the amount, according to the study, so liquor isn't any more likely to make you fat than beer when you drink the same amount. There is the same amount of alcohol, 0.6 ounces, in 12 ounces of beer, 5 ounces of wine, 8 ounces of malt liquor and 1.5 ounces of 80-proof liquor. If you do drink alcohol, do so in moderation. This means no more than two drinks per day for men or one drink per day for women. Choose drinks that are lower in calories, such as a wine spritzer, a gin and diet tonic, a rum and diet cola, vodka with club soda or a light lager, recommends registered dietitian Tanay Zuckerbrot in an article on the Fox News website. Critical Reviews in Clinical Laboratory Sciences: Is Alcohol Consumption a Risk Factor for Weight Gain and Obesity?